Use gestures to control your music while driving or when your attention is elsewhere! 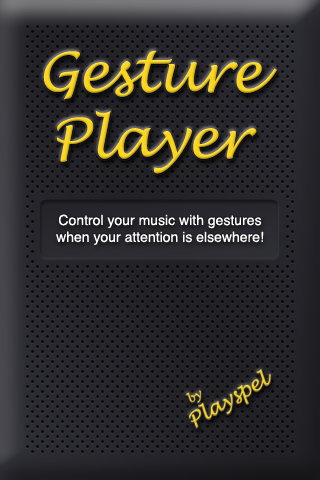 Gesture Player is an easy to use music player app where you use finger gestures to control the music player. Perfect for situations were you are not able (or allowed!) to concentrate on small player buttons on your iPhone or iPod Touch. Perfect for controlling your music in the car. Use gestures to control your music while your attention is elsewhere! Option for leaving the screen on so your iPhone or iPod Touch won't go into sleep mode. This means you don't have to unlock when you want to control the player. Show or hide normal player buttons. 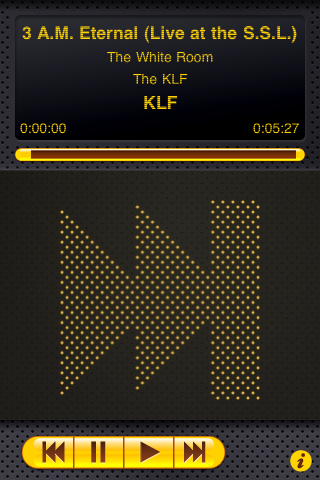 Player buttons are hidden by default for a nice minimalist interface. 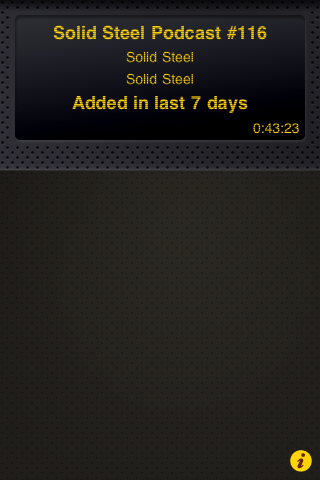 Show or hide the timer remaining display. Shown by default, turning this off will save some battery time. Swipe sensitivity, setting towards max/left means you have to be more precise with straighter swipes, setting it toward min/right allows less precise swipes with more deviation from the swipe-line. By default this is set to the middle. Gesture control requires music with playlists to be on your iPhone or iPod Touch. We will add other category controls during June. 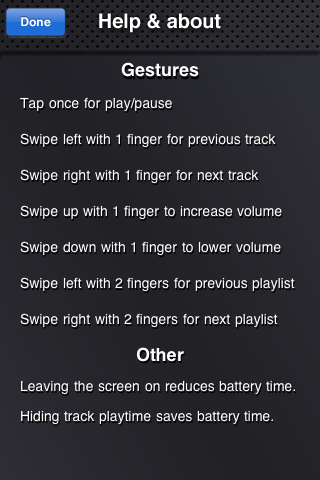 If there are no playlists but there are songs then Gesture Player will ignore playlist requests. If you sync your iPhone or iPod Touch and remove the playlist which Gesture Player was playing then you can simply choose another playlist.